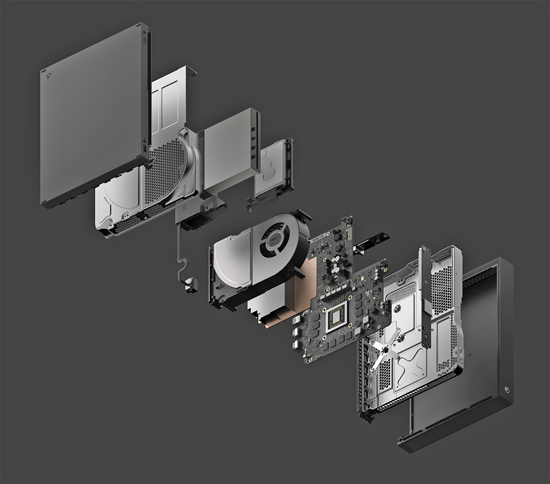 For gamers that demand the ultimate in graphics performance, Xbox One X is the world’s most powerful console with 40 percent more power than any other console. Games play better on Xbox One X. Xbox One X offers true 4K gaming, HDR and wide color gamut, and default supersampling means even new 4K games will look great on a 1080p screen. Existing Xbox One titles on Xbox One X will look great, run smoothly, and load quickly. Xbox One X works with all your Xbox One games and accessories as well as Xbox Live, the most advanced gaming network, giving you more ways to play. Xbox One X: built for 4K. Xbox One X is built to take advantage of 4K. Watch 4K Ultra HD Blu-ray movies on Xbox One X. Record clips in 4K resolution at 60 frames per second. Experience premiere sound that puts you in the center of spatial audio. High Dynamic Range and Wide Color Gamut provide brilliant graphic details in light, shadow and reflections and 6 teraflops of processing power means games play better than ever before on Xbox One X. Begins rolling out to all Xbox One markets on November 7, 2017.